Exporting your daily sales information to Xero is easy. You simply check your cash up totals are correct, press a button and your done. But first, have you configured posBoss to talk to Xero? Once configured, head to the Financials > Cash Ups the management site. Check over your totals. At this point you can edit your Actual takes if there are any incorrect totals. After reviewing the information in the cash up process pages, if you agree with the totals and information recorded, you can send the cash up to Xero. 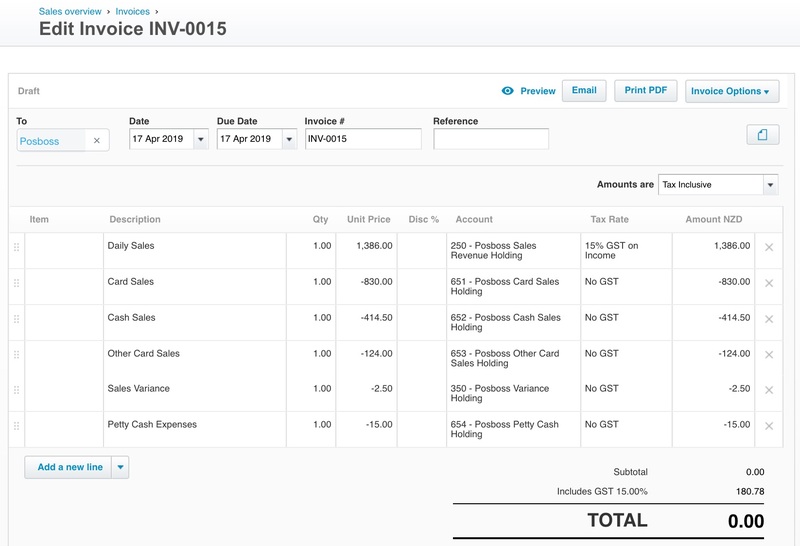 This creates a Draft Sales invoice in Xero. It is important to send only correct values to Xero. If you are not intending to bank the amounts you send to Xero then your posBoss iPad App and your cash up will not match your accounting system. To send the cash up to Xero, simply press the Send to Xero button at the bottom of the Settlement page. What gets set through to Xero? Where can I see the posBoss information in Xero? Approving the invoice confirms the correct GST and adjusts the Sales amount. Now the Sales, Cash, Card, Variance and Petty Cash amounts appear in your Profit & Loss and Balance Sheet. * Nb the tax rates shown below are New Zealand GST rates. For Australia the Tax Rate for Sales will be “GST on Income” and the other accounts will be “BAS Excluded”. GST will be calculated at 10%. After Xero has imported your bank feeds you will have the cash, eftpos and card deposit amounts to reconcile against the Posboss Card Sales HoldingA/c, the Posboss Cash Sales Holding A/c and the Posboss Other Card SalesHolding A/c. These holding accounts should total zero after the bank reconciliation has been completed. If the holding accounts contain balances then check the amounts you said would be banked as they will differ to what was actually banked. 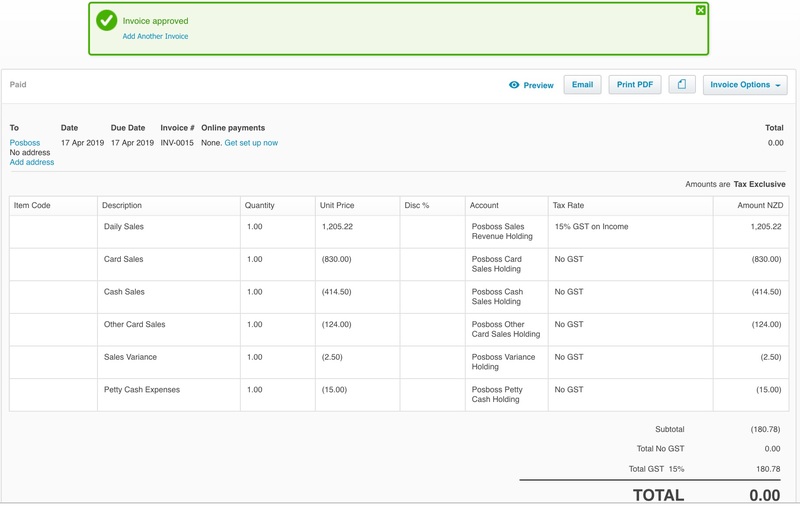 For processing Petty Cash taken from the till you need to go into the Xero Expense Claim module, enter the expense against the correct expense account (Stationary, Office Expenses, Milk etc) and attach the receipt. When applying payment to that Expense Claim select the Posboss Petty CashHolding A/c instead of the Bank account and you are DONE!.